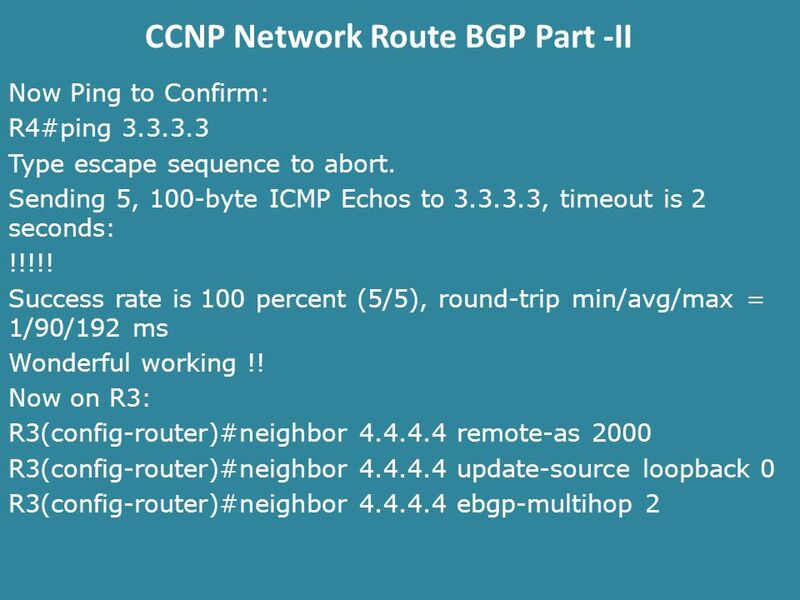 CCNP Network Route BGP Part -II. 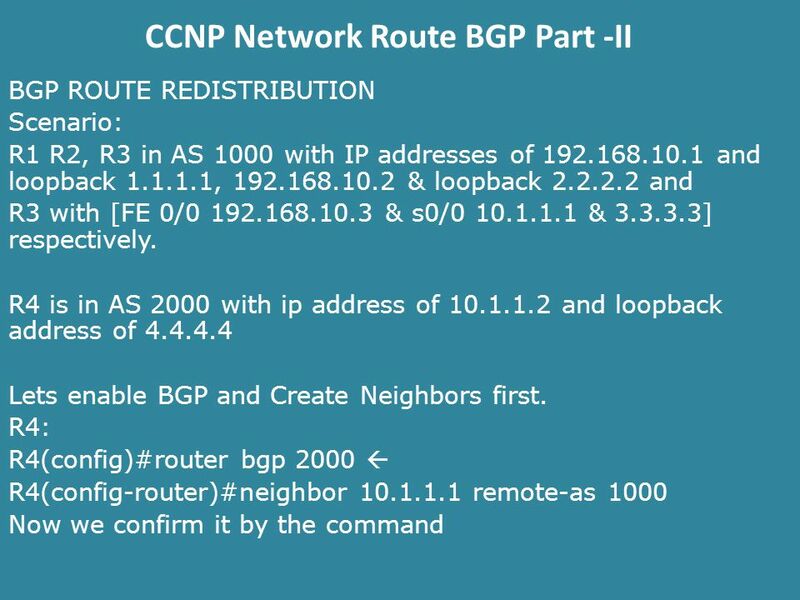 BGP ROUTE REDISTRIBUTION Scenario: R1 R2, R3 in AS 1000 with IP addresses of 192.168.10.1 and loopback 1.1.1.1, 192.168.10.2. 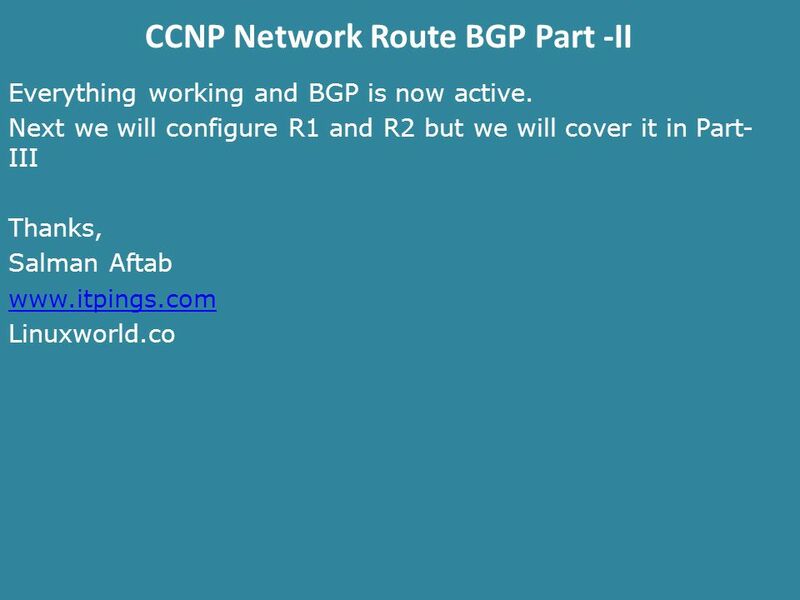 3 CCNP Network Route BGP Part -II R4(config-router)#do show ip bgp summ BGP router identifier 1.1.1.3, local AS number 2000 BGP table version is 1, main routing table version 1 Neighbor V AS MsgRcvd MsgSent TblVer InQ OutQ Up/Down State/PfxR 10.1.1.1 4 1000 0 0 0 0 0 never Active As we can see at the moment it is in Active state, meaning its actively looking for neighbor which is not present. The reason is that we have not configured R3 or its neighbor. 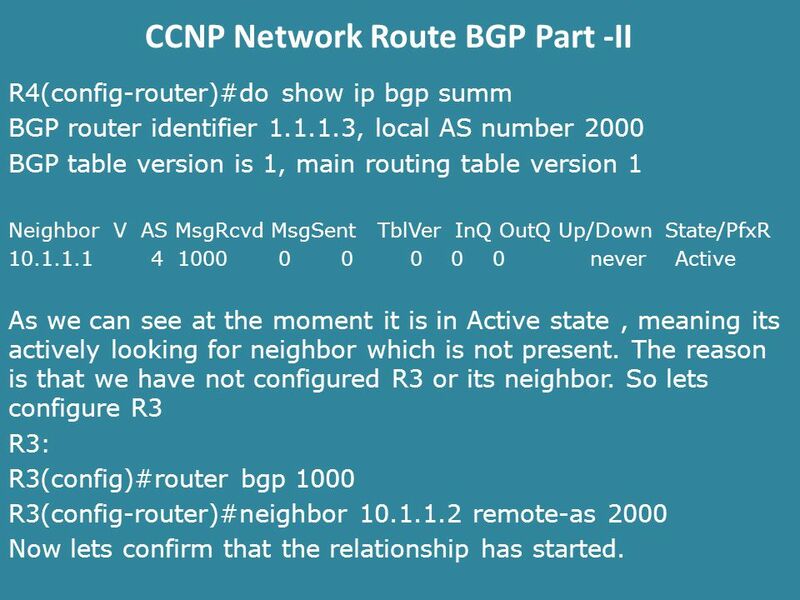 So lets configure R3 R3: R3(config)#router bgp 1000 R3(config-router)#neighbor 10.1.1.2 remote-as 2000 Now lets confirm that the relationship has started. 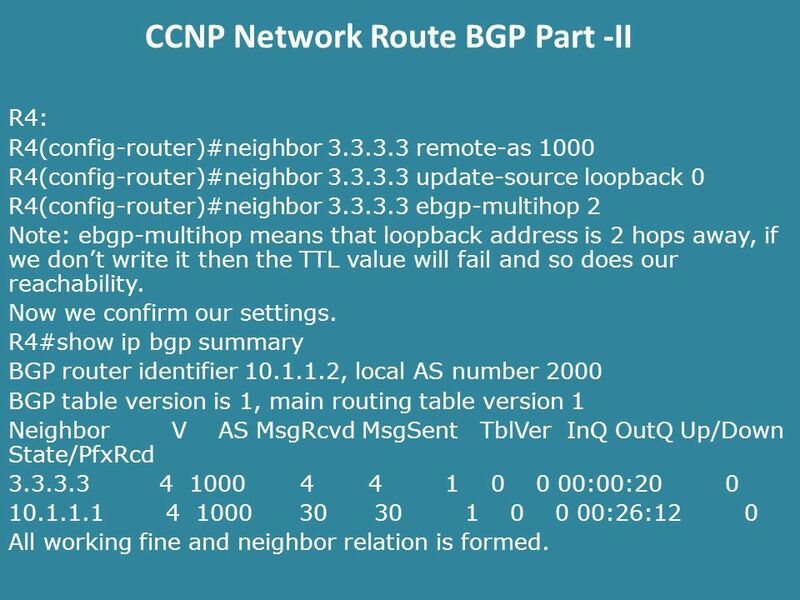 6 CCNP Network Route BGP Part -II R4: R4(config-router)#neighbor 3.3.3.3 remote-as 1000 R4(config-router)#neighbor 3.3.3.3 update-source loopback 0 R4(config-router)#neighbor 3.3.3.3 ebgp-multihop 2 Note: ebgp-multihop means that loopback address is 2 hops away, if we don’t write it then the TTL value will fail and so does our reachability. Now we confirm our settings. 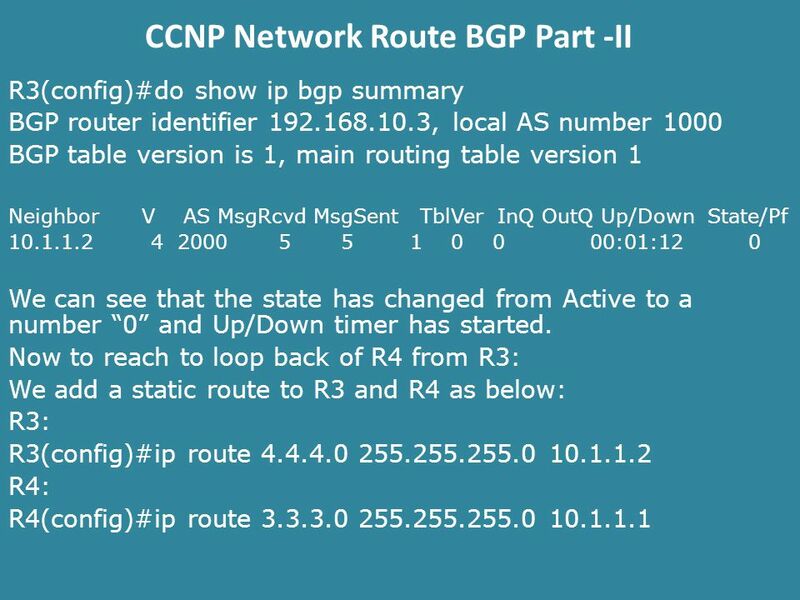 R4#show ip bgp summary BGP router identifier 10.1.1.2, local AS number 2000 BGP table version is 1, main routing table version 1 Neighbor V AS MsgRcvd MsgSent TblVer InQ OutQ Up/Down State/PfxRcd 3.3.3.3 4 1000 4 4 1 0 0 00:00:20 0 10.1.1.1 4 1000 30 30 1 0 0 00:26:12 0 All working fine and neighbor relation is formed. 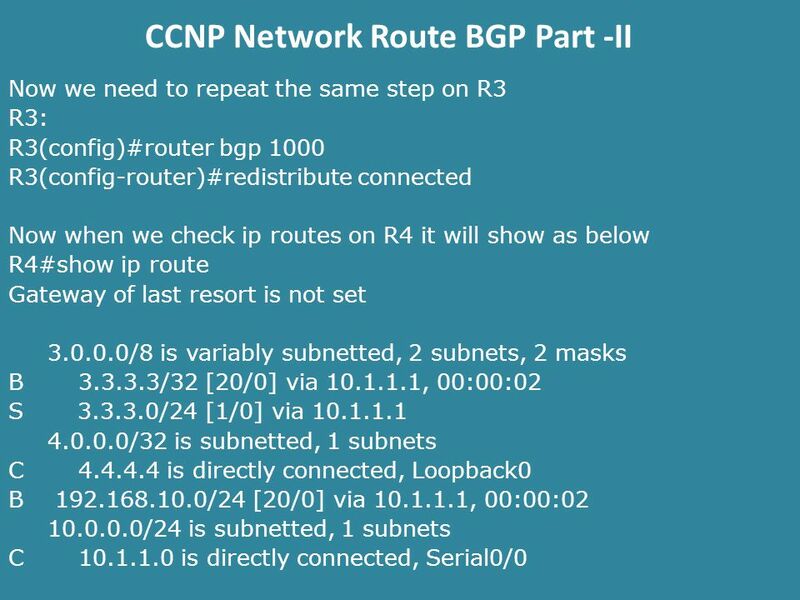 8 CCNP Network Route BGP Part -II To solve this routing issue we issue command redistribute connected as below on both routers R4 and R3: R4: R4(config)#router bgp 2000 R4(config-router)#redistribute connected Now if we look at BGP R4#show ip bgp BGP table version is 3, local router ID is 10.1.1.2 Status codes: s suppressed, d damped, h history, * valid, > best, i - internal, r RIB-failure, S Stale Origin codes: i - IGP, e - EGP, ? - incomplete Network Next Hop Metric LocPrf Weight Path *> 4.4.4.4/32 0.0.0.0 0 32768 ? *> 10.1.1.0/24 0.0.0.0 0 32768 ? 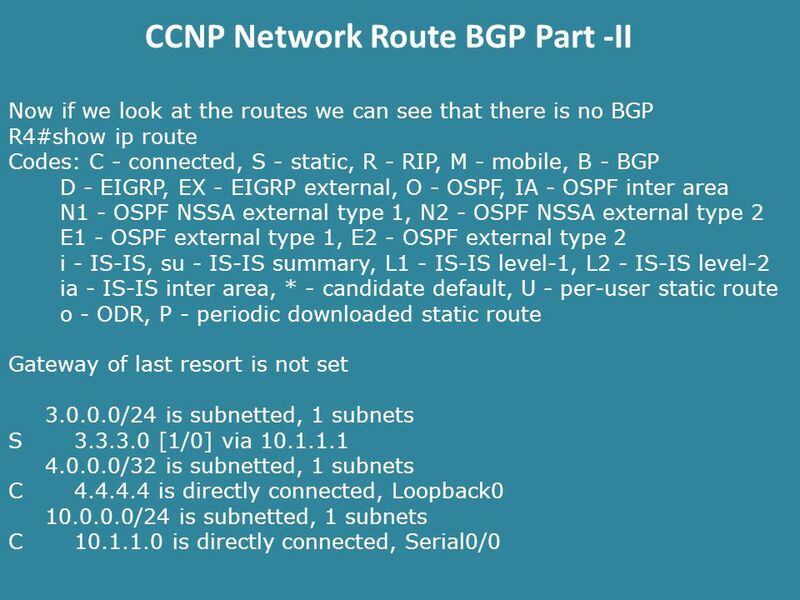 Download ppt "CCNP Network Route BGP Part -II. 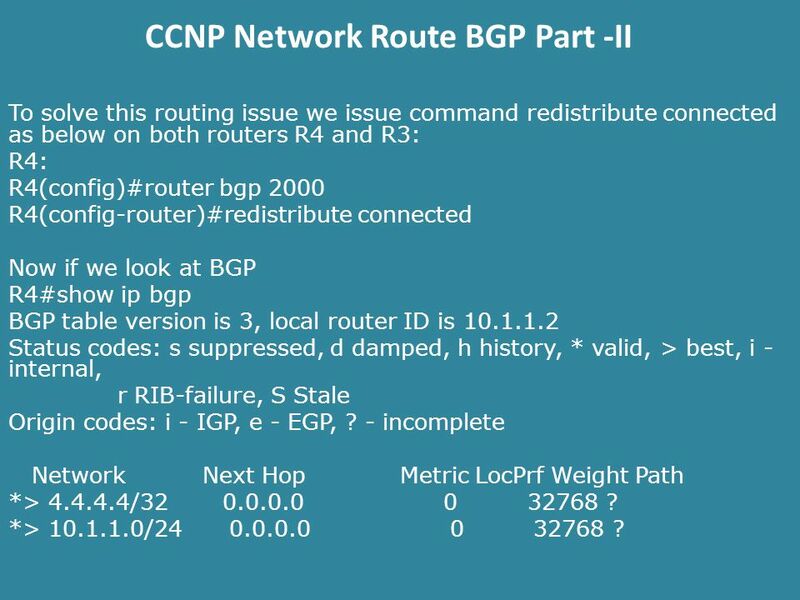 BGP ROUTE REDISTRIBUTION Scenario: R1 R2, R3 in AS 1000 with IP addresses of 192.168.10.1 and loopback 1.1.1.1, 192.168.10.2." IPv6 EIGRP John Rullan Cisco Certified Instructor Trainer Thomas A. Edison CTE HS Stephen Lynch Network Architect, CCIE #36243 ABS Technology Architects. Chapter 7 RIP version 2. IP Routing Static Routing Information management 2 Groep T Leuven – Information department 2/14 The Router Router Interface is a physical. 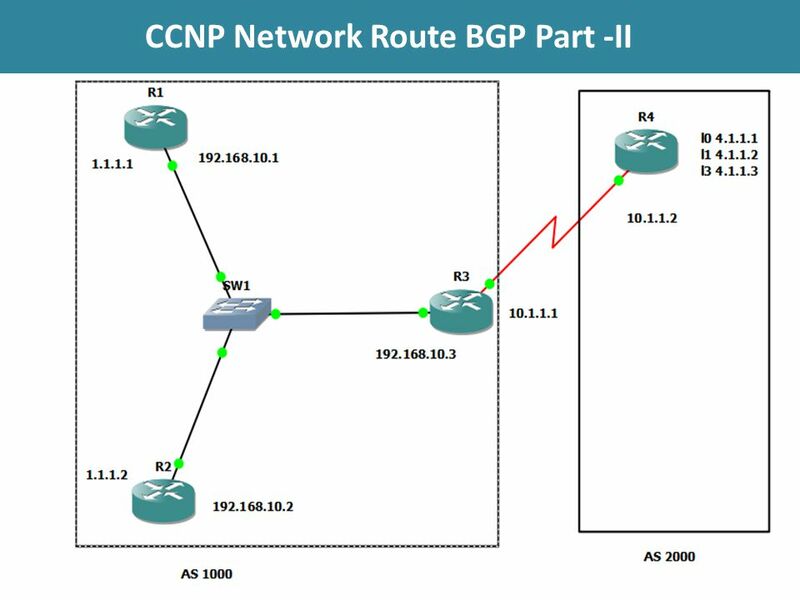 CCNP Network Route BGP Part -I BGP : Border Gateway Protocol. It is a distance vector protocol It is an External Gateway Protocol and basically used for. RIP V2 CCNP S1(5), Chapter 4. Interfacing Interior and Exterior Gateway Protocols. © 2006 Cisco Systems, Inc. All rights reserved. 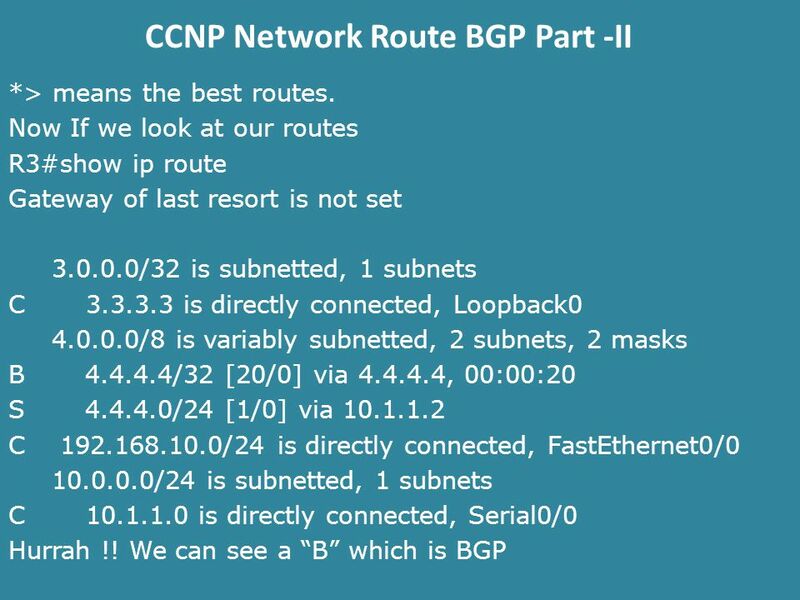 ICND v2.3—3-1 Determining IP Routes Introducing Routing. Chapter 7 RIP version 2 CIS 82 Routing Protocols and Concepts Rick Graziani Cabrillo College Last Updated: 4/7/2008.